I will never clean my stove the hard way again! 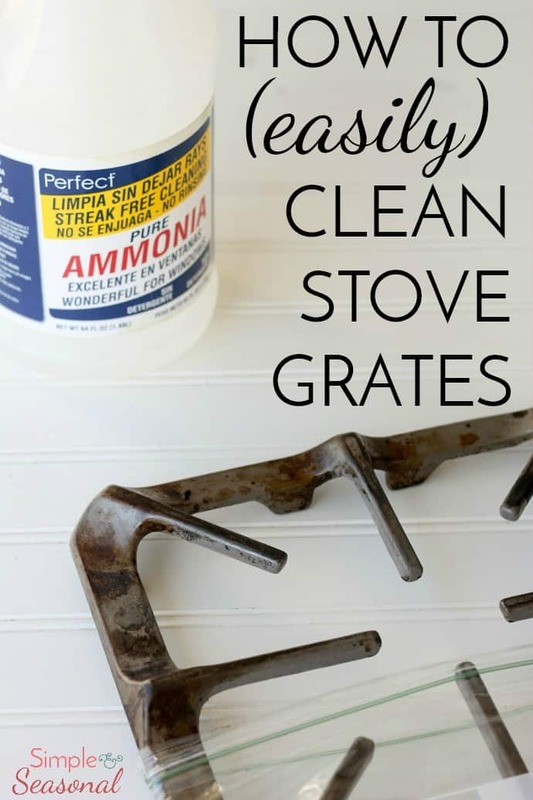 This is hands down the EASIEST way to clean stove grates. No more soaking and scrubbing for hours! My stove grates are always filthy! Every month or so, I’ll pull the whole stove top apart and soak everything in incredibly hot water all night long. Then the next morning I spend a couple hours scrubbing the food and grease buildup off all the creases of my enormous stove grates. Ugh. I hate that chore. Then I discovered this. When I saw this suggestion on Pinching your Pennies, I pinned it immediately and went to work. 1-2 gallon zip lock baggies. Check. My ginormous stove grates won’t fit in a one gallon zip-lock bag! I went looking for two gallon bags at several stores, with no luck. I finally found some yesterday at the dollar store! If you don’t want to run all over town looking, you can get them on Amazon here. (affiliate) I put my grate in a bag, and poured about 1/4 cup of ammonia in the bag. (I used more than suggested because it also came from the dollar store, and I wasn’t sure how potent it was.) Then I sealed up the bag and left the grate on the counter. You can leave the bag in a dish in case of leakage, but I’ve never had any major problems. I left it out all night, and the next morning I went to work. I tried wiping it down with the scrubby side of my sponge, but that wasn’t quite enough, so I switched to a stainless steel scrubby. That did the trick. You still have to do some scrubbing to get all the gunk off, but nothing like the elbow grease that is normally required for this chore! It definitely is easier than the soak and scrub method. I have done this many times now and it works so well, I’ll never try to clean them another way! I know it’s not perfectly shiny, but my old stove grates just don’t have it in them anymore. The marks that are still showing are actually where the finish has been scratched completely off over the years. I’m pretty sure the stove is original to the 1987 house! But, you can clearly see how all the nasty cooking gunk is gone. Be sure to pin this awesome tip for later! I spray easy off on the grates and stove top before going to bed and in the morning just rinse/wipe. I’ve never had to scrub since I staring doing this. I put my stove grates in the kitchen sink, cover with hot water and then pour in powdered dish washer soap (maybe 1/4 cup). I let it sit for a few hours while I do other stuff. Scrubbing is minimal. You can also use powdered dishwasher soap in the laundry for whiting pillows and such. I use powdered dishwasher det for all my baked on dirty pots & pans. Sprinkle a little in and add hot water. Let sit overnight. Very minimal scrubbing if any. I add my stove grates to crusted on roasting pans after a big meal. Dishwasher det works great on soap scum & tile in the tub/shower too. I just was mine with the dishes in the dishwasher. Done regularly they don’t get very dirty and it’s so simple. That is a very smart idea! If I remember to do it regularly enough. 🙂 I’ll have to try that on mine. I doubt it will get the cooked on food and spills off, but maybe so! My grates are the full length of the stove top, the zip bags are too small, can you use the bags you get at the grocery store that your groceries are packed in? My stove grates are also full length of my stove top. I use large garbage bags with drawstrings I wrap the grates in several layers of newspaper, put into the garbage bag and take out to the patio. I pour about 1/2 cup ammonia into the bag, making sure all the newspaper is saturated. Leave soak overnight. In morning, remove the grates, being careful to no inhale the fumes, then I spray them off with the garden hose. I bring them in and finish cleaning off at the sink. Most everything rinses off easily. I have also used WD-40 with some success but you would need a HAZMAT facemask. I use a trash can bag, put my grates and oven racks in it in the laundry tub. I pour ammonia in the bag and tie it closed. In the morning all,you need is water and a rag to finish the job. This works for grill grates as well. Been doing it for years. That’s a smart tip for getting them all down at once! 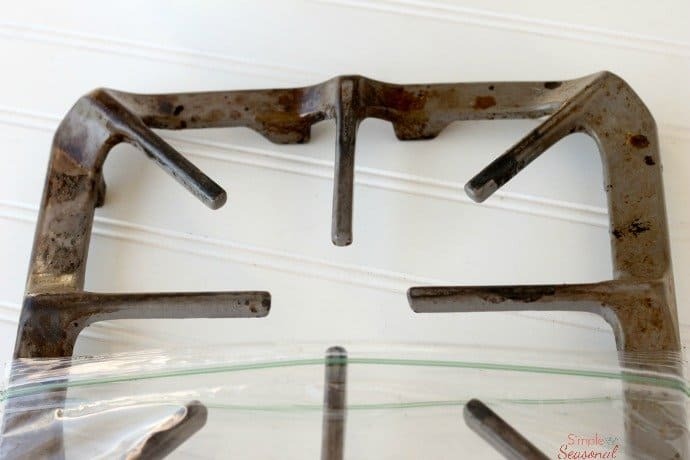 Are your grates cast iron? You know, I honestly don’t know what they are made of. They are heavy. But if they are cast iron there’s a finish over that. 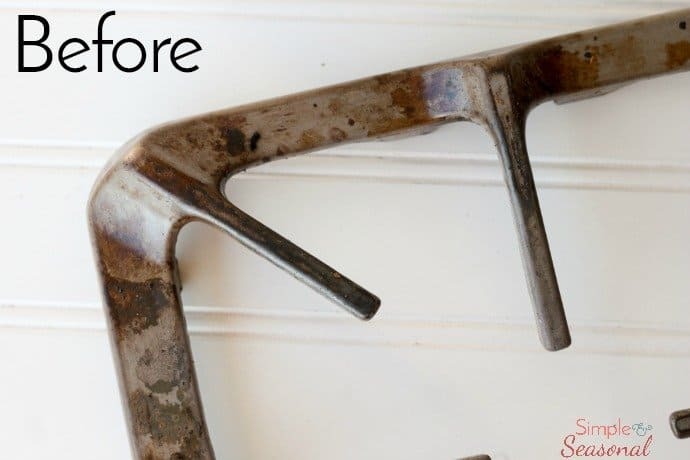 I’ve used this cleaning method on a few different stoves and it’s worked on all of them. I’m not sure if that makes any kind of difference. You’re so welcome. It’s like a happy miracle isn’t it? 🙂 I use it every time I clean my grates unless I’m out of the big plastic bags. It certainly beats scrubbing until your fingers are raw! So I’ve done this before and yes, it works! but I’ve yet to find how to clean the top of the stove. I even tried doing ammonia then covering the top with saran wrap. Didn’t work. P-U. Ideas? I’ve always just used Comet and a lot of elbow grease for the stove top. It wipes clean easier than the grates for me. Sorry! Maybe someone else will have an idea? I clean the stove with stove top cleaner but not the milky cream kind I use the spray kind I soak it down let it sit for about 20-30 min and come back and scrub and use a razor blade to scrape excess food or burnt stuff off but scrape on an angle so you don’t scratch. Nicole, Me too! A friend who does housecleaning uses liquid comet on just about everything.And her elbows are never greasy. spray easy off blue and let it overnight,then use stainless steel curl pad and that will be all. Baking soda works well – mix it with some water to make a paste. Let it sit and ‘soak’ for awhile on the really bad areas… then scrub a bit. Usually doesn’t take much scrubbing. Rubbing alcohol works wonders on my white stove top. I pour a bit on the cold stove top and let sit about 5 minutes and wipe with a paper towel. I use rubbing alcohol on my bathroom counters because it cuts right through the hair spray “gunk” that gets left on the surface. I’ve never tried it in the kitchen. Great idea! I will try this tomorrow for my ongoing hairspray problem. Great idea. We accidentally discovered an even easier way to clean them- Goo off! I’m sure any citrus based gel cleaner would work as well. Much less smelly than ammonia. 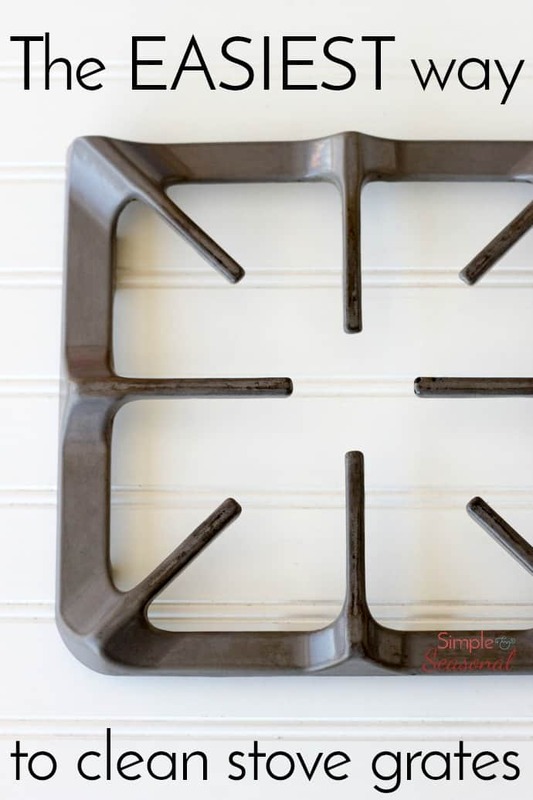 I put grates and spillpans inside my self cleaning oven when I need to clean the oven or just the grates. I set the dial for self-cleaning and a couple hours later they’re done. I wipe them off with a dish towel because they get an ash residue. Works like magic. That’s a great idea! I won’t be running the clean cycle on my oven any time soon as it’s still WAY too hot, but come winter, I’ll have to try that! haha, i did that and it worked really well but burned the little rubber thingys right off. lol, oh well at least my oven is cleaned more often then not now!! 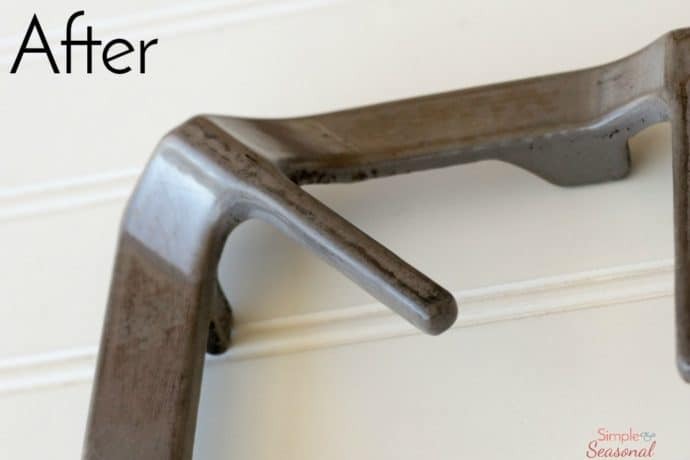 You have rubber on your stove grates?